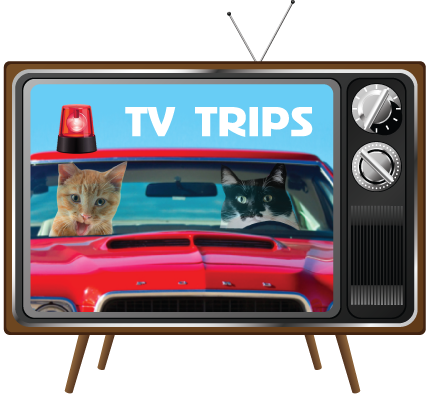 About today's TV Trip Rewind: Starsky & Hutch was one of Glogirly's first favorite cop shows. Even though Hutch was the tall blonde who went on to become a one hit wonder with his song, "Don't Give Up On Us Baby," it was Starsky who stole her heart. Must have been his trademark sweater and shades. WAFFLES: Hey Boss, how come YOU get to be Starky? KATIE: It's STARSKY, Waffles. Starsky. WAFFLES: So why can't I be Starky? KATIE: *sigh* Because, Waffles... you can't drive. WAFFLES: Well can we at least call the show Waffles & Starky??? KATIE: NO. That wouldn't make any sense at all. WAFFLES: But wasn't Starky the one that got all the hot babes? KATIE: Waffles. Listen to me. 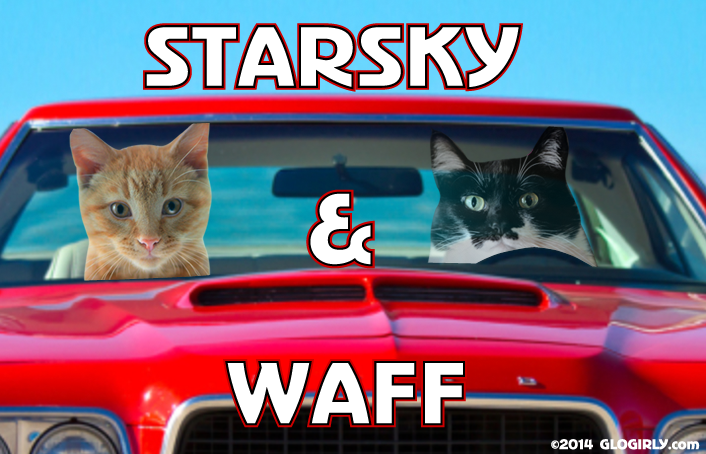 It's Starsky & Waff. I'm driving. Let's just get on with it, ok? There's crime to fight in Bay City. And we said we'd meet Huggy Bear an HOUR ago. WAFFLES: Right on, Boss. I'm ready for all the hot babes. KATIE: Waffles! You can't wear that sweater! It's Starsky's sweater. WAFFLES: I TOLD you I should be Starky. KATIE: Waffles, take off the sweater and get in the car. NOW. Or you're never going to be my partner again. URGENT: Only 4 days left to vote for Rasta Kitty Cocktail! Voting is just about done in the latest mike's HARDER design contest. We are embarrassingly behind... probably because we've been sipping a little too much Mad Kitty Cocktail! We'd be ever so grateful if you could help spread the word and drum up a few more votes for our can design! 1. Just click the voting link below and login either with Facebook or your email. The site you're going to is called ZOOPPA. 3. There's a voting "slider" on the right hand side of the Rasta Kitty Cocktail page. Slide it ALL the way over to cast 5 votes. That's the maximum number of votes. You can only do this once. 4. Then just click the VOTE button. That's it! Enter to win! 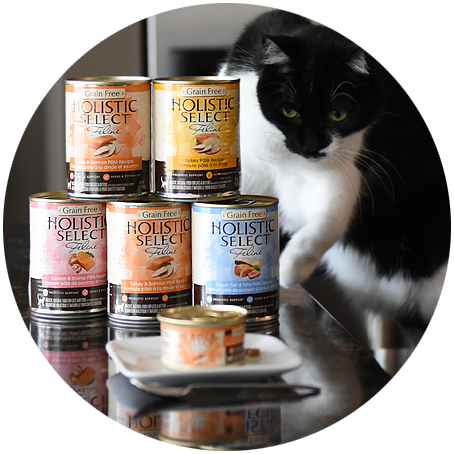 One lucky ready will win $50 worth of Holistic Select's new canned cat food recipes. We've got a great review of this new favorite of ours too. Patty you're a hoot with Waffles!! You have a crush on him as much as I do! :). Best blog! Yeah..but she got to sleep with him..HAHAHA! The paw prints MAKE the car! Happy Caturday to our two favorite crime fighters. If he takes off the sweater he'll be STARKY NEKKID! I loved that show too!! I personally loved the car the best!! Waffles you actually wear that sweater and those shades pretty good. Matches your beautiful red fur. And Katie you were smart to take over the driving! Not all muscle cars are meant to be for the boys. P.s. Tell Glogirly to watch the Starsky and Hutch movie starring Ben Stiller and Owen Wilson. She'll enjoy it and have great memories of her favourite cop show plus a delightful surprise at the end! MOL!!! Let Waffles wear the sweater, Katie, then you don't have to. MOL... I always loved Starsky's sneakers! Purrs from Deb and the Zee and Zoey Gang! 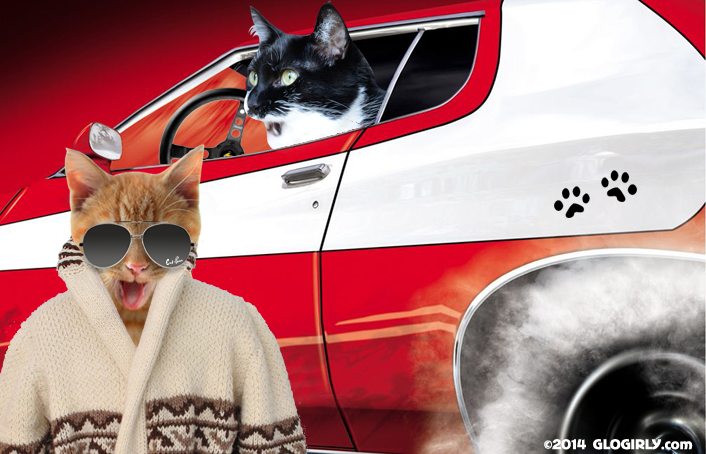 OMC, the manpeep is a HUGE Starsky & Hutch fan. We can't wait for him to wake up so we can show this to him!! Our mom remembers that show! Waffles, you make a great Starsky wannabe! Maybe you can take turns being Starky. I never liked those mirrored sunglasses..I hated talking to someone while staring at myself..lol..
You always take us down memory lane! IN a good way. Cute as always Katie and Waffles. Hope yous havin' a pawsum weekend. Haha, that was great! I was wondering about the shades...... BAM! Shades AND sweater! :D Awesome! PS - Voted, hope you win!! Maxwell: Waff, dood, that sweater is SO you. You are a trip, Waff. I Didn't Touch That Christmas Ornament. Honest. Have a Shaggy Chic Christmas & Giveaway! Waffles Wednesday: HO HO HO!